This article first appeared in the Rushville Republican on Tuesday, January 3, 2017. There are many opportunities for someone to volunteer at Rush Memorial. One of the most visible and important volunteer positions available, is at each hospital entrance. Volunteer stations exist at the Admissions desk, 13th Street entrance, and Medical Office Building entrance. Duties include greeting patients and guests, giving directions to various departments, and escorting guests to areas of the hospital. These are great positions for “people” persons. If you enjoy being around others this spot is for you. And you have the luxury of volunteering a few hours or as many hours that you choose. Other volunteer opportunities exist within specific departments. Duties might include sorting, filing, answering the phone, and more. At the time of the volunteer orientation a discussion of your specific skills and the needs of the departments wanting a volunteer will occur. It is the hope to match the volunteer with a department that the best use of those skills can be used. Presently there are volunteers in the Oncology, Human Resources, Surgery, and Foundation departments. Sue Cook and Brenda Smith are the two newest members to the RMH volunteer team. 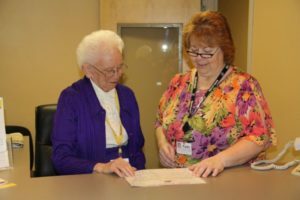 Both stated that they enjoyed people and have enjoyed meeting and helping patients and guests coming into the hospital. Brenda is located at the Admissions desk and Sue is located at the MOB entrance. New in 2017 will be the RMH Shuttle Service. Volunteer drivers will be needed to man the shuttle during a Monday-Friday shift or as substitute drivers. A valid Indiana driver’s license is required along with a background check. This person will be driving an 8 passenger shuttle and assisting wheelchair passengers on and off the shuttle. She shuttle will be driving patients and guests throughout the hospital campus. If you would like to learn more about the RMH Volunteer program go to www.rushmemorialhospitalfoundation.com, click on Ways to Give, then Volunteer. You can find the application there. Fill out and return to the RMH Foundation at the corner of 13th and Main streets. Or you can call the RMH Foundation at 765-932-7568 for volunteering information. Please consider making 2017 your year to give back.